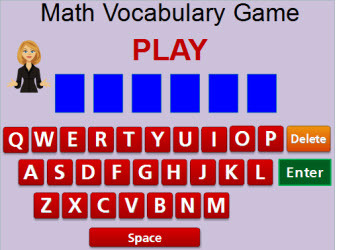 Play this interactive 1st Grade Vocabulary Game to review important math vocabulary terms. This game is suitable for elementary students. For each word, students will have up to 1 minute to find the correct answer. Each vocabulary word has an illustration or an example. This game can be played on computers, iPads, and other tablets. You do not need to install an app to play this game on the iPad. To play other fun math vocabulary games, visit this link. Return from the 1st Grade Vocabulary Game to the Elementary Math Games, 1st Grade Math Games, or to Math Play.